If you look around my house, you'll notice I do certain things the same way in each room. There are colors, textures, patterns and other details that tend to pop up in every room, although not always in the same form. I think this consistency makes the entire space feel cohesive. I call it my "decorating formula." Whenever I stick to my personal formula, I'm pretty confident I'll be happy with the space when it's done. Almost all of the paint colors I gravitate toward are in the "cool" color family. Most of them are shades of grey, blue and white. 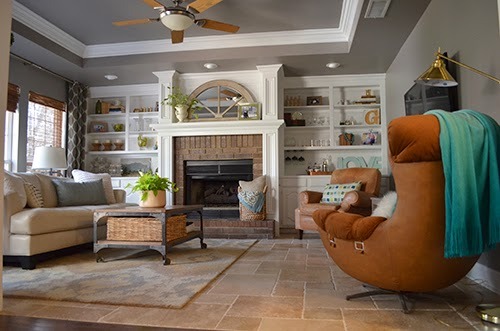 But I don't want the house to feel cold, so I try to balance those colors with warm accents like cognac leather chairs or weathered wood furniture. 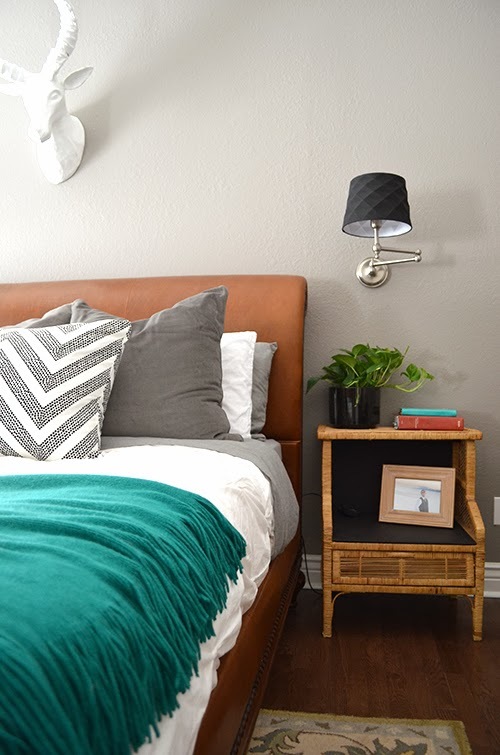 Add some shiny, reflective surfaces and a couple of healthy plants, and I end up a room that feels just right for us! Our den is a great example of my formula in action. Note the grey walls, white cabinetry, warm leather chairs, sparkly accessories on the built-in shelves and two live plants. Our formal living room is a bit more formal than our den, but I tried to dress it down with wooden mirrors and pops of color on the sofa. I think those small details help balance the coldness of the grey walls and slick surfaces on the mirror and coffee table. I remember working on our dining room and thinking to myself, "Something is missing." I added the greenery in the vase on the shelf and instantly felt better! 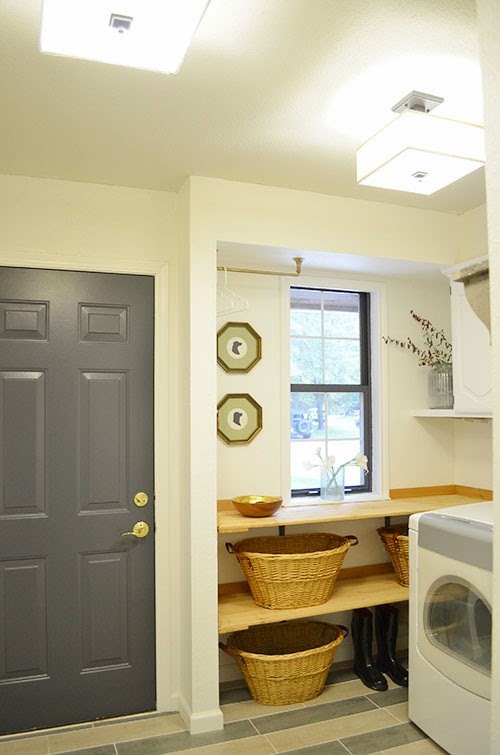 Even our laundry space follows our formula. The small details really help this room, and I love the contrast between the rugged shelves and shiny hardware. The formula isn't quite complete in our master bathroom. If we added some fresh flowers on the counter, it would feel a lot more lived in and homey. Right now it has a clean, spa-like vibe, which isn't necessarily a bad thing for a bathroom. Now that I've figured out my personal formula, I always consider these elements when I'm working on a room. If it feels a little too sleek or cold, I often swap something shiny for something organic, like a rustic wooden bowl or a plant. If it feels a little too rustic, I try to dress it up with a crystal vase or flashy mirror. I'm a huge fan of striking the right balance between rustic and glamorous. While working on the new guest bathroom, I thought about these elements and made sure to incorporate them into our plans. 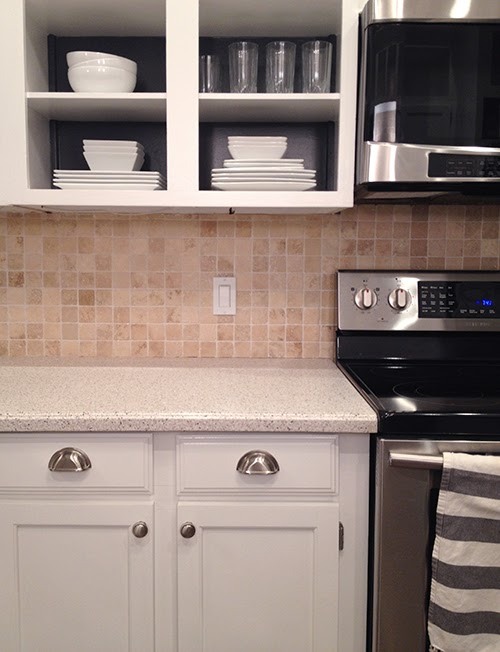 The materials we bought first – the floor tile, paint and back splash – were very white and cold. 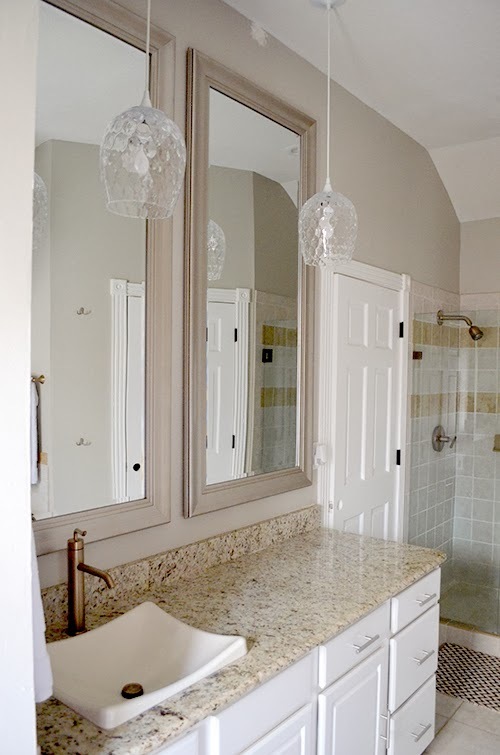 I knew I had to balance that with a warm color for the vanity, which I why I was immediately drawn to the vanity from Home Decorators Collection below. In the kitchen, we're warming up the white cabinets and corian countertops with some cottage-y open shelving and traditional library pulls. - Is there a good mix of old and new furniture? - Are there a couple of quirky flea market/thrifted finds that add personality? So, does this make you think about whether you have a decorating formula? Maybe you have one and didn't even realize it! I never thought about the particulars of my decor taste until recently, but now that I know I find it really easy to shop and make choices that will work with the rest of our house. 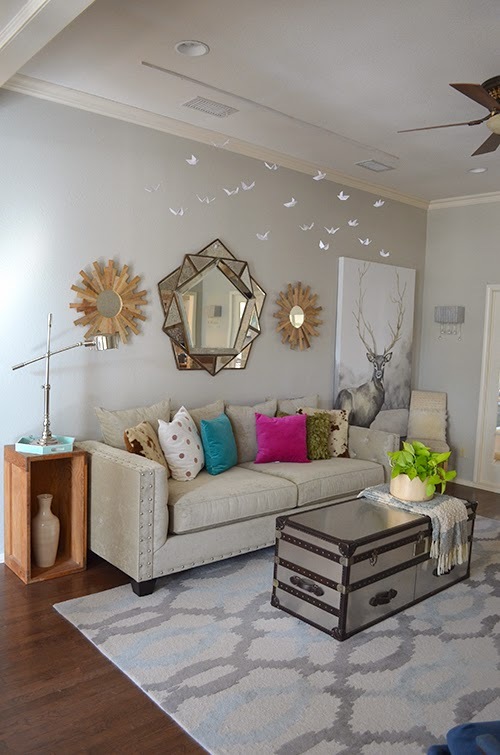 Take a look around your space and see if you notice patterns and trends from room to room. I'd love to hear what the keys are to your particular style. 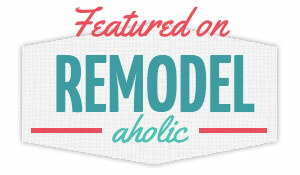 No home's formula is the exact same, which is what makes decorating so personal– and fun!